Japanese cars – some of the most famous in the world. Representatives of the Japanese automotive industry to securely hold a leading position worldwide. These include: Acura, Daihatsu, Hino, Honda, Infiniti, Isuzu, Lexus, Mazda, Mitsubishi, Mitsuoka, Nissan, Subaru, Suzuki. Almost all brands of cars Japan is known around the world, except for the company Mitsuoka. It is the smallest of the Japanese automobile firms specializing in the manufacture of retro cars, including retro cars of small and one sports car. Products Mitsuoka has a good popularity in the domestic market of Japan but virtually unknown outside of the country. Toyota is the undisputed leader of Japan, the Asia-Pacific region and one of the global leaders in the automotive industry. Widely known for its passenger cars. The range is unusually wide and has hundreds of models and modifications, many of which were specially produced for one particular market. Since 2007 has its own car Assembly production in Russia. Lexus is a division of Toyota producing cars in the premium class. Initially the products were targeted at the US market. In the 90s cars were delivered in Europe and since 1998 in Russia. Hino – a division of Toyota for the production of passenger buses and trucks. Recently has official dealers in Russia. Prior to that, in our country only imported used trucks from Japan, surprised the Russians with their original designs and unusual engineering solutions. Nissan – the second, after Toyota, the largest car companies in Japan. World famous for its cars, and in Asia – and even trucks and buses. In 1999, a controlling stake in Nissan was sold to Renault, then both companies took the course to the unification of their machines. Since 2009 Nissan has opened its own Assembly plant in Russia. Infinity – in the eighties, Nissan, and Toyota registered a separate brand for the production of premium cars for the US market. Later cars Infinity has gained recognition in Europe and Russia. All produced sedans, coupes and crossovers are built on the same platform-Nissan FM. SUVs and pickups also have a single platform but manufactured exclusively in the United States. Honda is the third largest Japanese manufacturer of cars and motorcycles. Prior to 1960, produced only motorcycles. The car has done against the interests of the government of Japan, and it has paid off. After a fuel and energy crisis of 1973, the economical Honda cars quickly became bestsellers in the US and then in Europe. Isuzu – the company is well known in Russia in the 90-ies. Since the early 2000s, started to gradually withdraw from the market of passenger cars, focusing on the market of trucks and diesel engines. The oldest automobile Corporation of Japan currently, passenger cars are not released, but occupies a leading position in the world in sales of trucks and diesel engines. In 2008, launched Assembly production of light trucks in Russia. Mazda is a popular brand in the world of cars. Working closely with Ford, so many models of both firms are made on a single platform. The world's only manufactures cars with rotary-piston engines. Since 2012 has its own Assembly plant in the country. Mitsubishi – widely known in Russia automobile company from the land of the rising sun. Before the end of the Second world war produced exclusively aircraft, mainly military. After 1946, engaged in production of machinery, mining, telecommunications, financial services, construction and insurance. In 2010 launched the production of its trucks and crossovers in our country. The leader in sales of projection equipment in Russia. Subaru – the original automobile company of Japan. In addition to the unusual design of its cars, all of them are equipped with boxer engines. In addition to Subaru, the boxer engine in the world uses only the Porsche firm. Like Mitsubishi, widely known for its success in Motorsport, especially in rally. Suzuki is a Japanese manufacturer "national" cars. All Suzuki models are quite simple in design and affordable. Because of this a large number of fans in Russia and other countries. Working closely with manufacturers, Fiat and Chevrolet. Also widely known for its motorcycles. 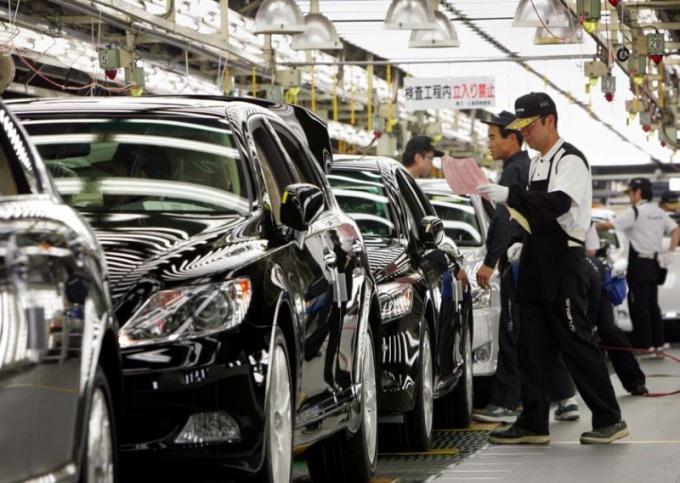 The right-hand drive vehicles exported from Japan are extremely popular in the far East. According to statistics, in this region the proportion of RHD Japanese cars exceeds 57%. Scion is a division of Toyota Tsusho Corporation, specialized in production of cars for the American youth. The products are manufactured and sold only in the U.S. and outside the country is unknown. Daihatsu is another division of Toyota, focused on the domestic and European market. Produces mostly compact cars and crossovers subcompact and compact class. In Russia is not officially sold, but motorists known through unofficial "gray" dealers. Acura – the North American division of Honda, oriented to the production of premium cars in the territory and for the US market. Has some popularity in Europe. In Russia imported only "grey" dealers, but in 2014 it is planned to establish offices. Dome – a little-known Japanese manufacturer of sports cars. Until 2000, participated in Formula 1 races. Currently executes orders for the construction of racing cars for the races "24 hours Le-Mana". Datsun is a Japanese automobile company, which produced cars from 1933 to 1986. In 1986, it was absorbed by the Nissan Corporation and ceased to exist as a brand. Since 2012, revived as a brand for the production of low-cost cars for developing countries. In the near future, sales will be opened in Russia. And the cost of cars will be comparable with the products of "AVTOVAZ".